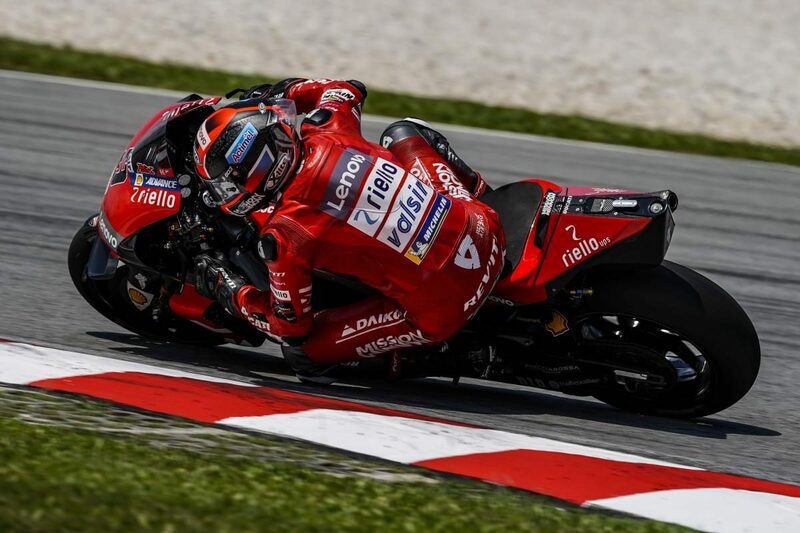 Danilo Petrucci led an all-Ducati top four as six riders surpassed the unofficial lap record on the final day of the Sepang pre-season MotoGP test. Petrucci clocked a 1:58.239s during the first hour on his Mission Winnow Ducati, easily bettering the 1:58.830s set by the man he replaced at the team, Jorge Lorenzo, in the corresponding test of 2018. Alma Pramac Racing’s Francesco Bagnaia ended up just 0.063s short on a GP18, and virtually the same margin faster than team-mate Jack Miller on a new-spec Ducati. Andrea Dovizioso rounded out the top four on his works-entered machine, with both he and Petrucci trying the Bologna factory’s new aero fairing. Petrucci would damage his fairing with a crash after his fast lap, while Miller went down for a third day in a row late in the afternoon. Monster Yamaha’s Maverick Viñales finished up fifth and LCR’s Cal Crutchlow was the fastest of the Honda riders for the second day in a row in sixth. The first of the Gresini Aprilias was Aleix Espargaro in seventh, ahead of SRT Yamaha’s Franco Morbidelli and LCR Honda’s Takaaki Nakagami. Valentino Rossi rounded out the top 10 on his Monster Yamaha as the injured Marc Marquez again took an early mark, leaving the Repsol Honda rider 11th. Leading the way for Suzuki Ectstar was Alex Rins in 12th and for Red Bull KTM Factory Racing was Johann Zarco in 17th. Andrea Iannone sat out the eight-hour session with an infection and was replaced at Aprilia by test rider Bradley Smith. The Qatar pre-season test takes place on February 23-25.